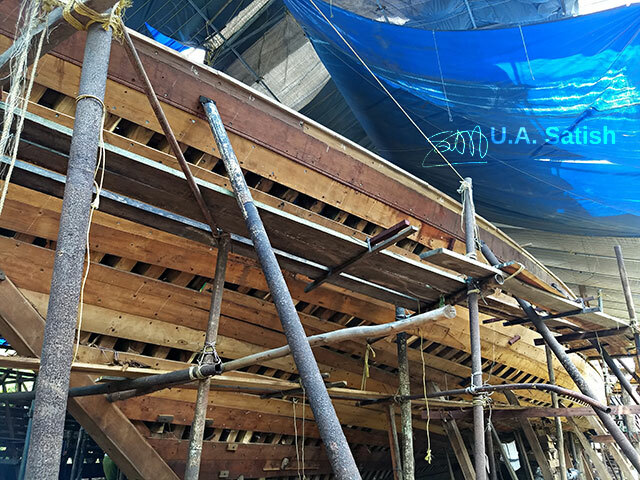 Uru is a large handcrafted ocean-going boat. 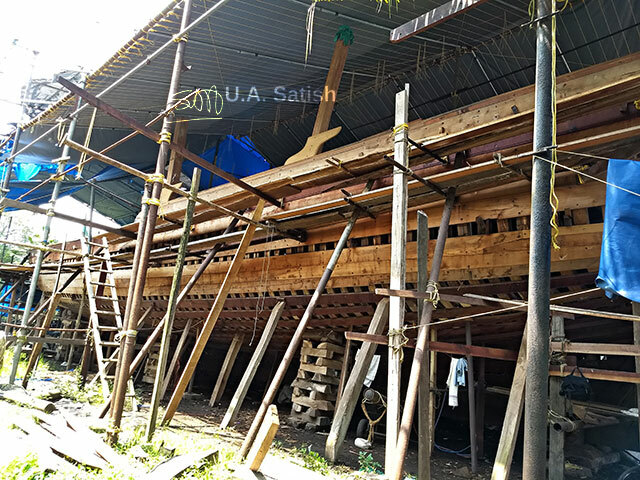 Master craftsmen build the Uru in Beypore near Kozhikode. They do not make use of technical drawings or blueprints. The boats were traditionally used for transporting goods and people. Most of them today go to countries in the Arabian Gulf as luxury boats. 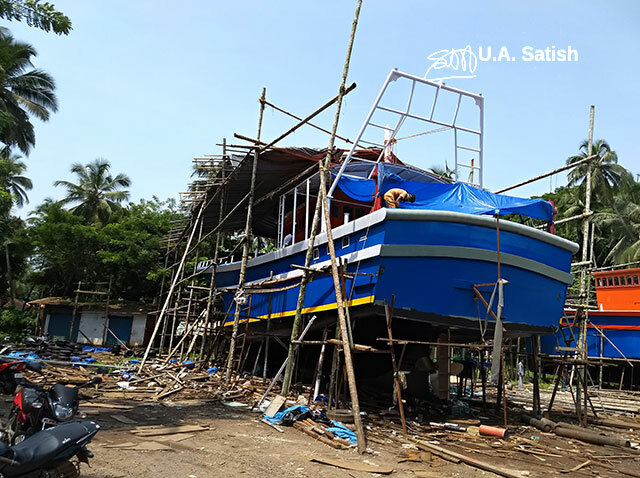 When we visited Beypore, we made use of the opportunity to witness the making of an Uru. We reached a sleepy lane, not far from Beypore beach. There were no signs to indicate the location of the boat building yard. Boat-building activities engage a number of workers. Stilts prop up the hulls on the banks of River Chaliyar. The wide-bottomed hulls ensure stability. 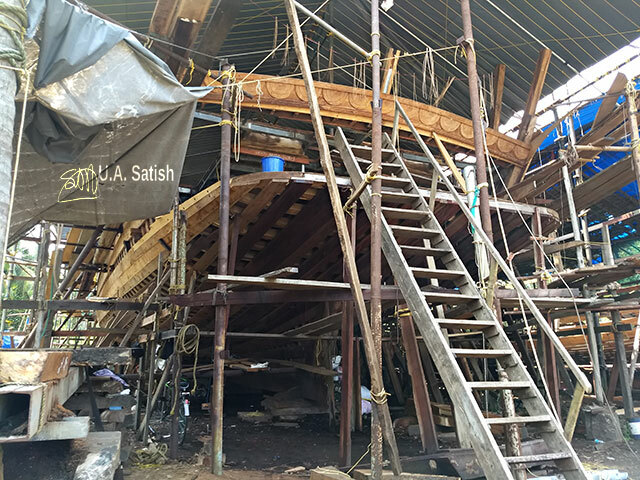 The craftsmen use teak wood in making of the boats. Teak comes from the forests of Nilambur. Malaysian wooden logs are also used. The hull mainly employs teak. The interiors contain jackfruit wood and rose wood. The workers use manual carpentry tools. Power tools have no place. 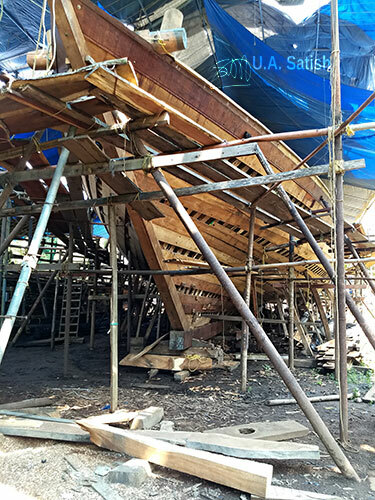 Boat building thrived during reign of the Zamorins who ruled Kozhikode from twelfth to the eighteenth century. The skilled carpenters handled making of Urus for the Zamorin’s navy. The business continued to develop after India’s independence, but suffered a reversal of fortunes in the 1970s due to endless hartals and strikes in Kerala. Khalasis or dockyard workers. usually launch the Uru. They use the pulley-wheel method to roll the boat on a bed of logs and float it out into the water. The effort uses round logs, wooden rollers, steel ropes, wooden pulleys and winches. The Uru goes Dubai for fitting of luxury interiors and installation of the engine. The price of an Uru can range between INR 4 to 7 crores. Please feel free to leave your comments in the section below.